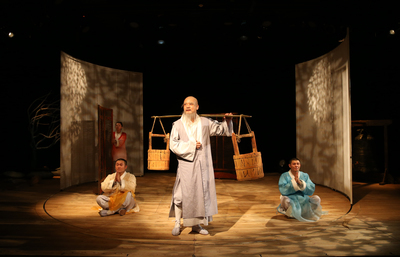 Melbourne children are in for a cultural treat on Saturday 2 September, with the China National Theatre for Children presenting two performances of Three Monks at Arts Centre Melbourne. Adapted from an ancient Chinese legend, this beautiful, wordless production integrates traditional Chinese opera, martial arts and classic elements of Chinese culture in an exploration of philosophy of unity, cooperation and the harmony between man and nature. Set in a temple on top of a mountain, the story follows an old monk master and his three students. The tale reflects on the journey of each of the monks and how they came together, taking audiences on a journey through emotions; laughter, anger and everything in between. Three Monks was developed in 2014 and has been warmly received by audiences in 14 countries. The performance arrives in Melbourne as part of the Families and Arts Learning programs. Arts Centre Melbourne’s year-round Families Program was launched in August 2009 and has grown in reputation to become a highly respected program both in Melbourne and nationally. When: Saturday 2 September, 2017. 11am & 5pm.